(Vatican Radio) Pope Francis says "an encounter with Jesus overcomes our indifference" and warned against bad habits that, even within a family, prevent us from truly listening to others and empathising with them. The Pope’s comments came during his homily at Tuesday’s Mass celebrated at the Santa Marta residence. (Vatican Radio) Cardinal Peter Turkson, head of the Vatican’s new dicastery for the Promotion of Integral Human Development, gave the opening address on Tuesday at an international conference entitled ‘The Economy according to Pope Francis – a case study of social market economy’. The conference, held at Rome's Pontifical University of the Holy Cross, was organised by the embassies of Austria, Germany and the Netherlands to the Holy See. The president of the Pontifical Justice and Peace Council, which will be incorporated into the new dicastery in January, explored Pope Francis’ call for financial leaders to move from a ‘liquid economy to a social economy’. The cardinal spoke first about the problems of a liquid economy in which financial flows matter more than people, in which technical efficiency and productivity trump human dignity. This type of economic reasoning, he said, goes hand in hand with our prevailing “self-centred culture of instant gratification” in which people treat their fellow human beings—and indeed all of creation—as mere objects to be taken advantage of and then thrown away. He contrasted that with the idea of a social economy which invests in people by creating jobs, providing training and working for the common good. Reflecting on the concepts of solidarity and subsidiarity, Cardinal Turkson said the encyclical ‘Laudato Si’ encourages us to expand our vision to include solidarity between generations, and even solidarity with creation itself. Finally the cardinal spoke about the practical application of these principles to three areas: employment, inequality and environmental degradation. He concluded with an appeal to all those involved in decision making to play their part in prioritizing jobs over short-term profits, in respecting the environment by investing in sustainable development and by paying taxes, instead of exploiting globalization to maximize profits. Pope Francis' post-synodal exhortation: "Amoris Laetitia"
(Vatican Radio) Pope Francis has written a letter to the bishops of the Buenos Aires region of Argentina, praising them for their document which spells out ways in which priests should apply the teachings of his apostolic exhortation ‘Amoris Laetitia’. The Pope was responding to a document by the bishops entitled ‘Basic criteria for the application of chapter 8 of ‘Amoris Laetitia’ which details ways of ‘accompanying, discerning and integrating weakness’ for Catholics living in irregular family situations. That chapter focuses on the need to support and integrate divorcees into the life of the Church, specifying that “in certain cases, this can include the help of the sacraments”. In his letter the Pope underlines the urgency of formation of priests for the practice of discernment, stressing that this is central to the task of accompanying families in difficulty. He calls for in-depth catechesis on the exhortation which he says will “certainly help the growth, consolidation and holiness of family life”. ROME- Ever since Pope Francis released a sweeping document on the family this March, there’s been ongoing discussion regarding what the conclusion actually is for divorced and civilly remarried Catholics who, according to previous Church teaching, were barred from receiving Communion. We may now have a new clue, one that stems from the pontiff’s former archdiocese in Argentina. In his letter addressed to Bishop Sergio Alfredo Fenoy of the diocese of San Miguel, and delegate of the Buenos Aires pastoral region, Francis writes that “pastoral charity” moves the clergy to go out and encounter “those who are at a distance, and once found, to start down the road of welcome, accompaniment, discernment, and integration” into the Church’s community. As he did recently in a private meeting with Polish Jesuits, Francis highlighted the urgency he sees in teaching seminarians and priests on discernment. However, now it seems the document sent to the pope was a draft, not meant for publication, and much less immediate application. The bishops’ directive, called Basic Criteria for the Application of Chapter Eight of Amoris Laetitia, is signed solely by “the bishops of the region.” Several sources have told Crux that this two-page document has so far been as divisive as the papal document. For this reason, revisions to the guidelines is expected, although how far-reaching they will be is still unknown. But the fact remains that Francis himself gave the present version his all-clear. 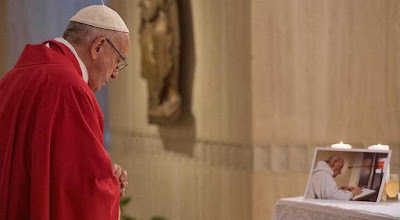 Six weeks after Fr Jacques Hamel was murdered at the altar during morning Mass in a savage attack claimed by the Islamic State, the 85 year-old French cleric was commemorated today at another intimate “parish” Eucharist – the Pope’s daily liturgy in the chapel of his residence, the Domus Sancta Marthae, during which Francis expressly placed the priest’s killing within "this chain of martyrs" who, over two millennia, have "suffer[ed] in prison, with death, torture, for not denying Jesus Christ. Pope Francis celebrates Holy Mass as a sign of his nearness to the family of Fr. Jacques Hamel and to the community of Rouen, France. (Vatican Radio) Pope Francis on Wednesday told the faithful not to be afraid in times of discouragement, poverty or difficulty because we can rely on God and He will provide solace. Reflecting on the Gospel passage by Matthew in which Jesus says: “Come to me, all you who labor and are burdened, and I will give you rest”, today – Pope Francis said - we hear the Lord calling the discouraged, the poor and the little ones to himself, and telling them they can always rely on God. And he invited all believers – especially those who feel most powerless - to trust in God’s mercy, to open their hearts to Him, even if they feel unworthy, and they will be filled with the joy of forgiveness. Pointing out that in approaching the Lord’s inexhaustible mercy, we will discover his “easy yoke”: Jesus – he said - who bears the burdens and needs of humanity shows us the way to salvation; by participating in his sufferings and by learning from his service to the poor, we come to know the will of God for us. (Vatican Radio) Pope Francis remembered the Exaltation of the Holy Cross on Wednesday, at the end of his weekly General Audience. In greetings to young people, newlyweds, and all persons suffering illness of any kind, the Holy Father recalled the liturgical feast, connected with St. Helen’s recovery of the Cross in the fourth century, and celebrated in gratitude for the redemption won for us by Christ on the Holy Cross, and in acknowledgement of the instrument of our salvation. To those suffering illness, Pope Francis said, “Find comfort in the Cross of the Lord Jesus, who continues His work of redemption in the life of every man. (Vatican Radio) The Council of Nine Cardinals, who are Pope Francis’ special advisors on the reform of the Roman Curia and on other aspects of governance and administration of the universal Church, held a regularly scheduled meeting this week, which opened on Monday, September 12th, and concluded Wednesday, September 14th. The Director of the Press Office of the Holy See, Greg Burke, briefed reporters on the three days of sessions on Wednesday morning. During the course of the briefing it emerged that the meeting, which took place over morning and afternoon sessions in which the Holy Father took part, were devoted in large part to further considerations about the way in which the various departments the Curia can better serve the mission of the Church, and focused in particular on the Congregations for the Clergy, for Bishops, and for Catholic Education, as well as on the work of the Pontifical Council for Promoting Christian Unity. The Cardinals also addressed the issue of the diplomatic service of the Holy See: the training and tasks of Apostolic Nuncios, with particular attention to the weighty responsibility they have in assisting the selection of candidates for the episcopate. (Vatican Radio) In a “world that suffers the crisis of a great orphanhood,” we have a Mother that accompanies and defends us. That was the message of Pope Francis during the morning Mass at the Casa Santa Marta on the feast of Our Lady of Sorrows. (Vatican Radio) Pope Francis on Thursday welcomed the Crown Prince of Abu Dhabi, Mohammed bin Zayed bin Sultan Al-Nahyan. Abu Dhabi is one of seven emirates that constitute the United Arab Emirates (UAE). At the end of the private audience, the Prince presented the Holy Father with an Afghan tapestry, which arrived from Afghanistan as part of a charitable project run his daughter. (Vatican Radio) Pope Francis on Thursday reflected on how we are created in the image and likeness of the Creator, and warned us – God’s children – against the temptation of undermining our intrinsic dignity by embracing false idols. The Pope’s words came during a speech to members of the Italian Biblical Association whom he received in the Vatican on the occasion of National Biblical Week. Pope Francis remarked on the theme chosen for the occasion which focusses on the male-female polarity in the Scriptures. He recalled the cycle of catechesis held by St. John Paul II during the first part of his pontificate regarding the many aspects of the relationship between man and woman stemming from the analysis of biblical texts. The Pope said that he himself, during a Catechesis last year, had occasion to stress that “God, after having created the universe and all living beings, created his masterpiece, the human being, whom He made in his own image: ‘in the image of God he created them; male and female he created them’” (Gen 1:27). And inviting those present to reflect on how we are created in the image and likeness of the Creator, he said that it is essential to note the differences that exist within creation. This, he said, helps us to understand the dignity of all men and women, a dignity which has its roots in the same Creator. (Vatican Radio) Papal diplomats from around the world are in Rome this week for a special Jubilee event that includes both practical refresher seminars and moments of spiritual reflection with the Holy Father. The year of mercy may be drawing to a close but Pope Francis is maintaining a packed agenda of Jubilee events. From September 15th to 17th he’s meeting with over a hundred representatives of the Holy See working in locations right across the globe. Of the 108 diplomatic missions in existence today, 103 are headed by archbishops serving as papal nuncios, while the other five posts are permanent observers to international organisations. The Jubilee event began on Thursday morning with Mass, presided over by Vatican Secretary of State, Cardinal Pietro Parolin, in St Peter’s Basilica, followed by two seminars held in the Synod Hall. The first of these was focused on the Pope, the Church and the world today, led by Professor Piero Coda, president of the Sofia University Institute founded by the Focolari movement just south of Florence. The second session, led by Rev. Robert Ghal from the Pontifical Holy Cross University in Rome is entitled ‘Genesis and the case of gender culture’ and will be followed by dinner with Pope Francis at the Casina Pio IV in the Vatican gardens. VATICAN CITY (CNS) -- In a change to church law, Latin-rite Catholic deacons may not preside at a wedding when one or both of the new spouses are members of an Eastern Catholic church. The new rule is one of the changes to 11 canons in the Latin-rite Code of Canon law that Pope Francis approved in order to harmonize the laws of the Latin and Eastern Catholic churches on several issues involving the sacraments of baptism and marriage. After more than 15 years of study and worldwide consultation, the conflicting rules were resolved by adopting the Eastern code's formulations for the Latin church as well, said Bishop Juan Ignacio Arrieta, secretary of the Pontifical Council for Legislative Texts. The bishop spoke to journalists Sept. 15 after the publication of an apostolic letter published "motu proprio" (on his own initiative) in which Pope Francis ordered the changes to the Latin Code of Canon Law, the 1983 text governing the majority of the world's Catholics. (Vatican Radio) Pope Francis said Mass in the chapel of the Casa Santa Marta on Friday. In remarks to the faithful following the readings of the day, the Holy Father reflected on the “logic” of Christian faith – the fundamental way of thinking that arises from real assent to the truth claims that Christianity advances – a logic he described as one of “the day after tomorrow” – a logic that looks forward to the resurrection of the body. Beginning with a passage from the First Letter of Paul to the Corinthians (15:12-20), in which the Apostle to the Gentiles specifically addresses the certainty of Christian faith in bodily resurrection, rooted in our certainty that Christ is risen from the dead, the Holy Father reflects on the implications of, and the challenges to, our faith. (Vatican Radio) Pope Francis addressed newly-appointed bishops in the Vatican’s Clementine Hall on Friday, reminding them of the thrill of being loved in advance by God and exhorting them to ‘make mercy pastoral’. The audience came at the end of formation course for new bishops organized by the Congregation for Bishops and the Congregation for the Oriental Churches. Make mercy pastoral, for you have experienced the thrill of being loved by God. That, according to Pope Francis, is the mission of bishops, especially those who are new Pastors of the Church. He said the bishops had been “fished, that is, caught by the love of God’s surprising mercy” and pointed them to the example of biblical figures like Moses and Nathaniel who were loved and known by God even before they realized it. Vatican Radio) Pope Francis on Sunday thanked the Vatican security force for their tireless service and warned against crimes that are connected to exploitation and corruption. The Pope’s words came as he celebrated Holy Mass for the Gendarmerie on the occasion of the 200th anniversary of the Corps of the Vatican Gendarmes. In his homily the Pope reflected on the reading of the day from the prophet Amos regarding three different types of people: the exploiter, the crook and the faithful man. The Vatican Gendarmerie is the Corps that offers constant watch over Vatican City and the extraterritorial areas belonging to the Holy See. The Corps ensures the security of these places, maintains public order, and works to prevent and stop crime, in addition to carrying out duties as judicial and border police. Pope Pius VII established the force in 1816 after the Congress of Vienna led to the restoration of the Papal States. (Vatican Radio) Pope Francis has asked for prayers for peace in a world in which war is everywhere. Speaking on Sunday morning after the Angelus prayer, the Pope said that on Tuesday he will travel to the Umbrian town of Assisi to participate in the Day of Prayer for Peace. “Today, more than ever, we need peace in this war which is everywhere in the world. Let us Pray for peace!” he said. Explaining that he is going to Assisi in the footsteps of Saint John Paul II who called for the World Day of Prayer for Peace thirty years ago, he invited all parishes, all ecclesial associations and individual believers across the world to participate in the event with their prayers. “Following the example of Saint Francis of Assisi, a man of brotherhood and meekness, we are all called to offer a strong testimony to the world of our common commitment twoards peace and reconciliation between peoples” he said. And he appealed to everyone to join in prayer on Tuesday: “may each of us take some time to pray for peace. The whole world united”. Reflecting on the reading from St Luke’s Gospel the Pope talked about the many ways in which we hide the light of faith, through jealousy and arguments, by plotting evil against our neighbours or simply by putting off until tomorrow the good that we should do today. The light of faith, he said, is a gift that each one of us receives from God on the day of our Baptism. He recalled that Baptism was called ‘Illumination’ in the first centuries of Christianity, a term that is still used in some of the Eastern Churches today. But just as Jesus warned the crowds not to conceal the light, so the Pope said if we hide that light we become lukewarm Christians. He talked about the many ways in which we risk putting out that light, starting with delaying the help that we’re called to give to our neighbours in need. Never put off doing good until tomorrow, the Pope said, because it’s a form of injustice and you can’t put ‘good’ in the fridge. Pope Francis went on to warn about those who plot evil against their neighbours instead of responding to the trust placed in them. Anyone who conspires againsta neighbour and takes advantage of that trust is a “Mafioso”, he insisted and the darkness of every mafia puts out the light of faith. Britain’s new ambassador to the Holy See has presented her credentials to Pope Francis meaning she can now officially begin her work representing the UK to the Vatican. This morning Sally Axworthy handed over the documents showing she can speak for the British government in a formal ceremony which took place in the state rooms of the Apostolic Palace, a grand setting where the Pope meets heads of state. When presenting her credentials this morning Ambassador Axworthy became the first to wear a specially designed diplomatic uniform for female ambassadors. The Holy See is one of the few postings where envoys are expected to wear full diplomatic dress for formal occasions.